"Prince Naseem Hamed has been beaten!" 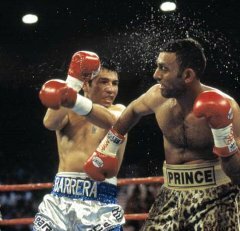 Though it was hardly conceivable before the fight it was now a painful reality for Hamed as Marco Antonio Barrera sat above the huge crowd at the MGM Grand basking in the adulation that his performance warranted. Life is a series of moments and this one must have been as sweet as any experienced by Barrera in his career. It is always a special thing when a fighter emerges from a fight with such glory especially against the odds and Barrera had announced himself to the world with such complete authority that it was impossible to deny him respect. the mind games started well before a punch had been thrown. 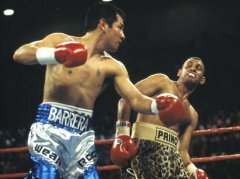 Perhaps even more remarkable than his own performance were the odds that Barrera had to overcome, in an extremely good natured build up it was made clear that Barrera was undertaking a rigorous weights regime in order to make the 126lb division limit, this would be his first fight as a featherweight. Couple this with the fact that he was facing a fighter in Naseem Hamed whose unbeaten record was a tribute to his unorthodox style and practically unparalleled punching power. An edge that Hamed would not posses in the fight though would be the one that had proved to be such a vital part of his fighting make up in practically everyone of his fights……the psychological one, and the mind games started well before a punch had been thrown. The fight truly needed no hype, anyone who knew anything about boxing realised that this was about finding the premier featherweight in the world at the expense of any title belt, this was accentuated by Hamed relinquishing the WBO title he had held for over five years in order to make the fight happen. 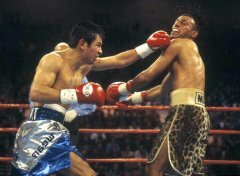 Two of the most significant points emphasised in the build up to the fight were Hamed's almost mythical power and Barrera's intensely aggressive style. The promise of power versus pressure meant fireworks and the entire boxing world awaited the opening bell of what was perceived would be a modern classic. When that bell finally rang there was indeed pressure but it didn't come in the form that had been anticipated, it had begun for Hamed in his dressing room with a slight hand wrapping issue being blown into a minor crisis, forcing a large delay for the increasingly impatient Vegas crowd that watched Hamed order his hands to be re-wrapped over and over again. A tense atmosphere gripped those moments as it seemed that Hamed was reluctant to make his way from his dressing room to the ring, the importance of the fight for both men regarding their careers was not lost on anyone but more than likely for Hamed the realization that he was walking into uncharted territory was beginning to consume him. 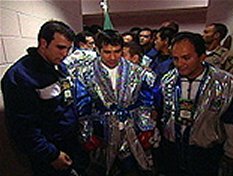 Meanwhile Barrera continued his preparation with patience and growing confidence in the high intensity atmosphere, he looked completely at home, like a man that had been forced to look inside himself before and find courage and strength he didn't know he ad……something Hamed had never been forced to do. Barrera had already won the first round. 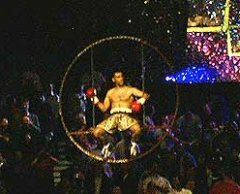 He entered the ring greeted by thousands of adoring Mexican fans who had come to see him do what no man had done……..shortly after, the hostility that accompanied Hamed to the ring was not used to fuel his confidence but for the first time it got under his skin, previously he had thrived in the pressure cooker of the big occasion but there was something missing this time. As the fight unfolded many things became clear, pre-fight Hamed had repeated his desire to achieve a knockout and round after round he sought after it with an almost crude desperation, meanwhile Barrera did apply his pressure but it was not in the form of the walk forward style he was renowned for, instead it was displayed with controlled aggression, he would attack but never over commit and allow Hamed to draw him in, forcing Hamed into being the aggressor unnaturally. Chaos reigned in the Hamed corner as round after round the fight slipped from his grasp, strangely he had abandoned his unique and unpredictable style in favour of stalking Barrera, attempting to land one big punch throughout the entire fight. Some attribute this change to the influence of Emanuel Steward as it was close to a style that had been so successful for his previous fighters, but there was also the fact that Hamed would have felt enormous self induced pressure to produce on HIS defining night as it was seen. Barrera had completely turned the tables on Hamed, solving Hamed's offensive approach with simple movement and supreme counter punching, he had shown himself to be a multi-dimensional fighter…….as if he wasn't dangerous enough already. I hadn't seen such audacious tactics carried out in a fight of that magnitude since Muhammad Ali himself told the world he would dance circles around George Foreman only to come out firing right hand leads and later exhausting Foreman with the "Rope a dope." Of course Hamed had made it easier with his basic approach and non-existent backup plan but there was no doubt that the boxing world was stunned by Barrera's boxing exhibition. More importantly, and deservedly he is finally acknowledged as a modern great. Today it seems that the psychological effects of the fight and his first defeat may still be haunting Naseem Hamed, an extended absence from boxing as well as no media coverage possibly signals a crisis of confidence for the man whose dreams of greatness now lay in tatters. 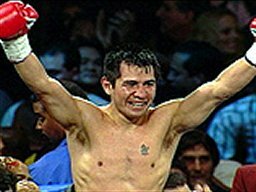 Meanwhile like Felix Trinidad.jr, Marco Antonio Barrera has earned a reputation as a fighter that not only beats a man……..he ruins him. 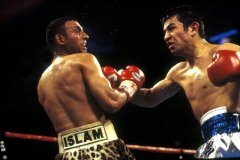 Many believe he has left Erik Morales scarred from their war and maybe now Hamed. Copyright © 2000-2004 - Saddo Boxing, All rights reserved.